I put this online a while ago, but I decided to revverize it. If you watch it, click the ad at the end so I can get paid! Video Comments, a WordPress Plugin is now available. You’ll see it here on the site on the videos that I’ve been posting from vloggercon (i also updated the uncle leron movies as well). This allows you to leave time-coded comments on videos. Check it out, and if you do any kind of video (or even audio-only) blogging/podcasting, download the plugin and give it a try. Anyone who knows me probably knows I’m a huge fan of Lost. And while I’m obviously not the only one, the image on the left is impressive. Of the top 20 shows on the iTunes Music Store, 16 of them are episodes of Lost! My guess is that a ton of people waited till the season was over and have just purchased the entire season all at once. In a way that’s the best way to watch it. It’s so bloody addictive that it’s hard to wait a week for the next episode, much less three weeks or more when there are reruns. The good news is that Next season there will be NO reruns. They are dividing the series into (I believe) 4 chunks of six episodes; six episodes will air week-to-week, and then no Lost for a little while. They’ve taken their cue from 24, which is tend to run with fewer interruptions, though for a shorter ‘season’. This summer, FOX is even going to rerun the entire fifth season in 12 weeks with back-to-back episodes every Friday. Now might be my chance to start a new addiction. After last weekend’s fun, I decided to take it easy and stay close to home this weekend. Friday at work was finished up with a Beer Bash where the MacBook team demoed their new babies while everyone drank Guiness and Harp (get it — black and white MacBook, dark and light beer? So clever!). I gotta say I don’t mind those glossy screens at all. After that wrapped up, I joined Jonathan and his friend Jeff for a trip to Palo Alto (Jeff was going to buy a skateboard; Jonathan and I bought a frisbee). Palo Alto is yet another beautiful California town, with an active downtown strip. We had some sushi before we headed back to Cupertino and played some night frisbee in the courtyard of our apartment complex. Saturday started off with a trip to the monthly flea market, which was somewhat uninspired — rows and rows of tents all with the same kinds of crap. Then we took a little shopping trip to San Jose, where I got some cheap Reef flip-flops at the Nordstrom outlet store. Then we were off to Santana Row (there was some debate as to whether this is actually ‘downtown’ San Jose), where we planned to see An Inconvenient Truth. We were all quite impressed with Santana Row — it’s very upscale, reminds me a little bit of Soho, with a lot of nice restaurants (mostly out of our budget for the day), and high-end (mostly) corporate chains. So it’s been a nice weekend so far. The film was incredible, and deserves more attention than I’m going to give it in this post, but needless to say, go see it. I’ve been thinking of joining Netflix again after a brief flirtation in it’s early days — I hardly watched the movies I rented because I was too busy galavanting. Since our cable system has no movie channels, and the nearest video store is a Blockbuster (which is bad enough) that’s barely in walking distance, and because there’s NOTHING to do in Cupertino, Netflix seemed like a great affordable choice for the summer. Feel free to invite me as a friend so we can share queue recommendations, or subscribe to my Netflix Queue rss feed. I participated in a session called Iterative Media: treating your media as code. 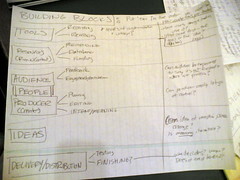 The gist was how can collaboraiton and constructive, group creation be applied to more traditional media output. Thanks to Josh Kinberg and Dee Harvey for taking awesome notes! Read on for the notes we took from the session. So a new startup called Click.tv is about to launch. And they’re working with the same basic ideas we’re working on for ITP Research: Video Comments and Re-imagining the Remote. the main functionality will include: the ability for the creator and those who watch the video to add annotations anywhere in the stream, and others later to click on those annotations and jump right to that point in the video. It’s cool to see some movement in this direction in the web 2.0 world. The click.tv people have addressed some of the issues we’ve discussed slightly differently. It seems there are ‘channels’ of comments which can be enabled or disabled. While this is interesting, it seems to be more appropriate for a moderated type environment (at least that’s what their demo shows). That said, they’ve addressed the situation with a nice clean UI and some interesting navigation elements.